You Can Keep Surviving or Start Thriving! For those of you who stayed let’s talk about the silliness of survival mindset and being powerless. Honestly survival is big time over rated. It stinks. You can do it, you can make it through just about any horribly trying, challenging thing that you can create or co-create with others. You are built to survive. Life does that, cells repair and replace in order to keep the body going. But surviving isn’t fun or satisfying. It weighs you down, zaps your energy and wipes the smile right off your face. So what can you do? You can Thrive! Do you know why it’s so hard to rid your garden of weeds? They know the secret of “thrival” and they do it well. Life expands to experience more and more of itself, reproducing in it’s own image. This works equally well for those weeds and those veggies. The secret is the kind of seed that gets planted. Doesn’t it make sense to set only the highest quality, exactly what you want, kind of seed in the ground? That’s what you get is what you plant so you make sure it’s something you enjoy. Life is like those seed. Your thoughts start the creation motion, then the brain gives you a chemical wash that brings about a feeling or emotion. That feeling matches that thought and if acted on, you create experience that looks and feels like the building materials used. There is only energy, thought is the seed. Feelings are like the soil, water and sun. If left there whatever is planted or thought and felt, will grow. Now you get an idea of why those beliefs are so danged important. They are the start of your creation. From those beliefs spring the plants that grow the fruit that you get to harvest or experience as stuff. Here is where asking questions plays a big role. When you inquire as to the truth of those beliefs, those creative thoughts and discard the ones that don’t work, never have worked and never will work, you can move into understanding. You are ready for a new idea, one that actually works. Gently nudge yourself into the possibility that you really do have power to choose what you experience. Don’t push it, just play around with it for a moment. For one week just play around there. What if you really did have the power to create your life exactly as you want to experience it? What would that look like, how would it feel? In what ways would your life be different. I’m going to stop here for now, (it’s supposed to be a blog post not a book chapter) and I’ll write more in a bit. Stay tuned. Oh, you can also grab a copy of one of my books, I suggest you get started with “How To Thrive In A Survival Mindset World”. 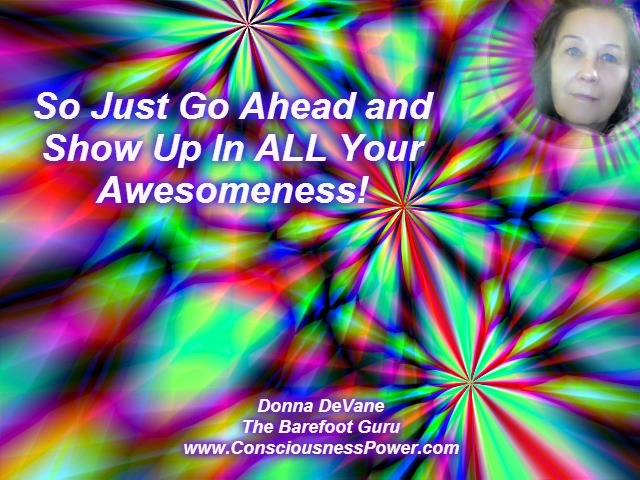 Leave me a comment, let me know how this is working for you and remember.. Just Go Ahead and show Up in All Your Awesomeness!